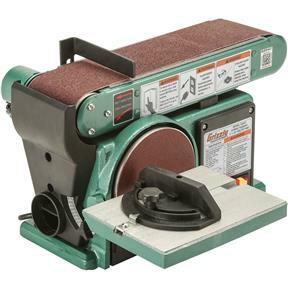 Take your benchtop sanding to the next level with this great compact Combo Sander. 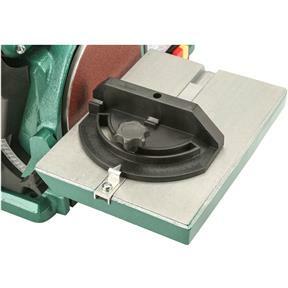 The solid cast-iron base and wide array of belt options means a great finish for your smaller workpieces.Features:Motor: 1/3 HP, 110V, single-phase, 3450 RPMBelt size: 4" x 36"Disc size: 6"Table size: 6-1/4" x 8-7/8"Cast iron baseSingle knob tracking2-1/2" dust port for belt and discBelt platen rotates 0–90°Approximate shipping weight: 39 lbs. Belt size: 4" x 36"
Table size: 6-1/4" x 8-7/8"
Approximate shipping weight: 39 lbs. I bought this product about two months ago and have used extensively since then, you won't find a better tool like for the money. Used it on my first cutting board. Worked great. Size and weight make it easy to move around on my work bench. It does the job, but seems a bit noisy - like it might wearout soon. Also, the table for the circular sander is difficult to secure. It vibrates loose easily. It seems to be a good product but after adjusting the belt multiple times it still wants to travel and i have to adjust it often. 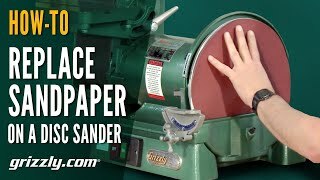 This is a decent sander for the price, but it has some design issues. The setup of the sander was quick and not that painful compared to other Grizzly products. It took a few minutes to adjust the tracking of the belt under not load. When actually sanding the first time, the belt tracking adjustment knob started rotating on its own causing the belt to walk off the rollers. This continued to happen repeatedly. 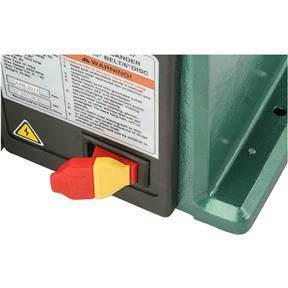 Grizzly product support admitted that this is a common issue with this series combo sander. I was advised to add a wavy washer or external tooth lock washer under the head of the adjustment knob to prevent it form rotating during operation. After discarding the rubber washer under the adjustment knob and installing a wavy washer purchased from the local big box hardware store, the belt tracked perfectly. The back stop plate is held in place by one bolt and was not square to the belt when installed. A little bending using a vise corrected this. 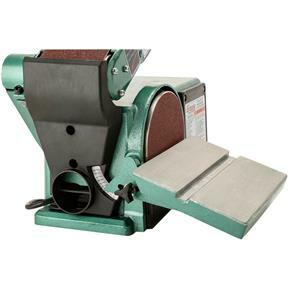 Overall, this sander has performed great once the issues were corrected. I guess someone kicked the box down some stairs as it came completely reboxed and the driver didnt even attempt knocking on my door. Lots of loose parts shaking around in the 40# box! I have not used this sander yet , I did unbox and put it together . It replaces a very inexpensive one that I used for a quarter of a century, which did all I needed. I feel confident this sander being of better quality will make a lot of saw dust , and be great fun doing so. I bought this product because the one that I had "bit the dust" and I needed a reliable replacement that wouldn't break the bank. I have other Grizzly products and am happy with what I have. 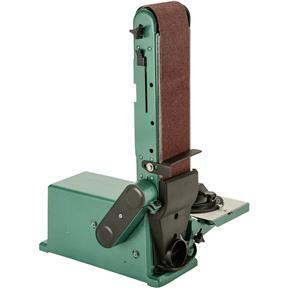 We are using this to sand mostly copper, brass, and aluminum for the hot wire foam cutting tools that we manufacture. The guide for the 4" belt sander was either bent, but we easily bent it back so it was square. Everything else went right together. It seems more robust and powerful than the Craftsman sanders we have used in the past. 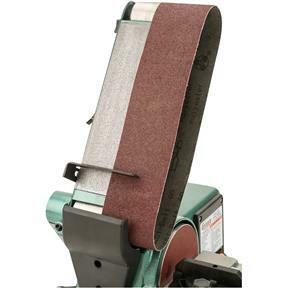 I did a lot of research before purchasing this sander, and believe it is the best in its class. This has the power to handle any sanding job. Just what I needed. This is the worst sander I I ever owned ,had for a year and replaced front belt pully once and sounds like I need to do it again , there are no bearings just a dry shafr tried lubing made no difference , don't understand all my other grizzly tools I love ,this one is a pain. Everything came just fine and am enjoying my item. It was a gift for my son. He was very happy to receive it. Really nice machine for the money. Had to do a little work to the table to get it to fit correctly, other wise it went right together and works fine. Have done just a little sanding to try it out but it seems to have plenty of power and is heavy enough so your work won't push it around. I'll look to Grizzly more often. It seems to be a nice machine except the power is to low. it needs a larger motor. 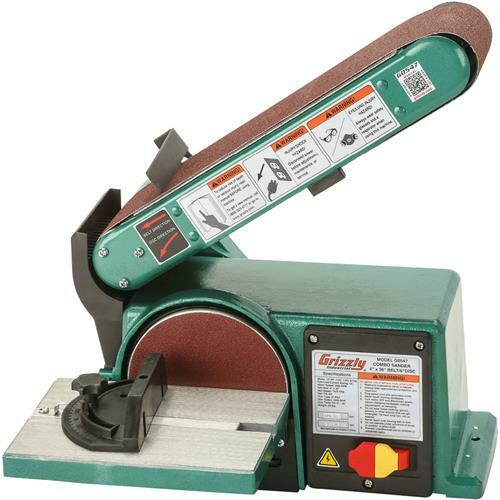 So far, I have bought a small band saw and a sander from Grizzly. The orders arrived promptly, were easy to set up, and work as expected. I would buy another tool from Grizzly without hesitation. Always wanted Grizzly Wood working tools. This is the first but will not be the last. Outstanding product for the money. I bought this a month ago and was pleasantly surprised. After having purchased a competitors model a couple years ago I was concerned about quality. The other unit, tho comparable in price, was almost useless in that I could easily stop the motor just by pressing on the work. Plus everything was either stamped steel or plastic. Grizzly's unit with it's cast iron base is a much more robust unit. While I can stop the belt by using to much pressure, I couldn't dog the motor. Very happy with my purchase and will be back soon to purchase more equipment. Mine is a small shop and I can't afford the bigger units. The sander is fairly well built, the rear stop could use some feature changes as it tends to tip back rather than staying vertical. Any real pressure with a large work piece will cause the belt to slip. I plan to take the belt off and spray some belt dressing on the rollers to try to give it more friction but over all the product works fine. Heavier than I expected. Only used it a few times so far, but quality seems very good. Christmas gift. Great table top sander for the home shop.